EBS – Engineered Base Soil Stabilizer is a linear molecular structure consisting of millions of molecules that are linked and cross linked together creating a stable multi dimensional bonding matrix. Utilizing the latest polymerization and best available reactor technology, EBS Soil Stabilizer coalesces and binds soil particles to create a solid mass, when applied to in-situ soils this will provide a substantially increased CBR. When applied to a properly prepared area as a surface seal will provide a strong water resistant surface that will also be protected from erosion, and material loss. 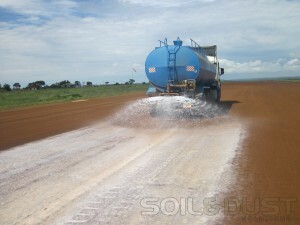 Used in numerous projects around the world Soil & Dust Solutions has proven time after time the successful results achieved when integrating our EBS into a soil stabilization and dust control project in accordance with our specifications.